Sports has the power of bringing positive transformation in the society. 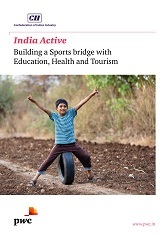 This knowledge paper, published jointly by CII and PwC India highlights the need for creating a bridge connecting sports with health, education and tourism sectors in the Indian context. This report presents an in-depth analysis of the current interactions between these sectors along with industry viewpoints that indicate some significant and structured interventions in making sports an integral part of education, health and tourism in India. It also provides our point of view on how bridging the existing gaps can help India grow and aims to make the relevant stakeholders think in this direction. It was published at the 4th SCORECARD Conference held on 26 July 2018 in New Delhi.